Former Alabama Supreme Court Chief Justice Roy Moore believes the state’s Ethics Commission must investigate and rule on a complaint filed against Attorney General Steve Marshall alleging he received illegal campaign contributions. Moore thinks the Ethics Commission should rule on Marshall’s complaint before November’s elections because the voters need to know if he has broken the law. Marshall, who was appointed attorney general by disgraced Gov. Robert Bentley, is accused of accepting $735,000 in illegal contributions from the Republican Attorneys General Association (RAGA). A complaint has been pending before the Ethics Commission for three months, but the commission has failed to act. Alabama law states explicitly that an out-of-state PAC must register if it plans to donate to a candidate running for state office and that PAC must follow Alabama laws. RAGA is not registered in Alabama and accepts contributions from other political action committees contrary to state campaign finances law. Moore says it’s not proper for the Ethics Commission to leave the public in doubt about whether Marshall has broken the laws. But the former chief justice holds out little hope that anyone will act before the election because of the presence of purely political considerations. 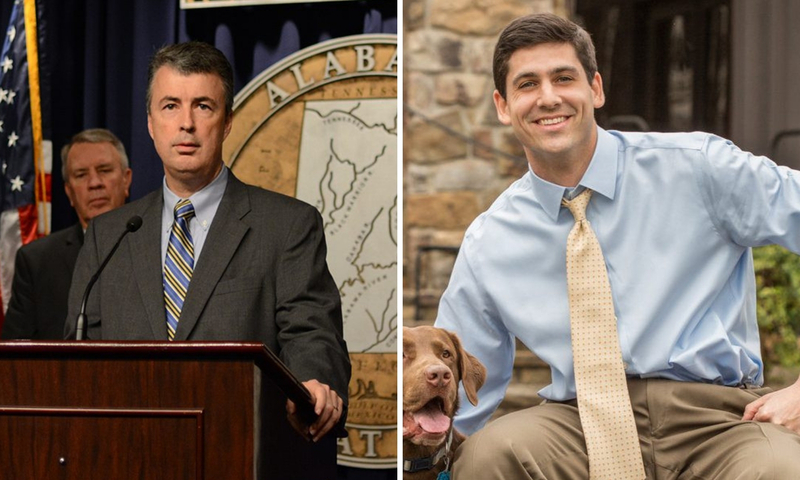 Ethics Director Tom Albritton and Secretary of State John Merrill have made it clear in statements and previous writings that others who sought contributions as Marshall accepted were participating in an unlawful act, yet the Ethics Commission refuses to call a special hearing to address the matter before the general election. Moore would not say who he is voting for but said his attorney and his son Caleb are voting for Marshall’s opponent, Democrat Joe Siegelman. Moore felt strongly enough about the Ethics Commission’s failure to speak out to alert the public to the problem, which he believes must be addressed for the good of the state. Both Siegelman and APR have called for the Commission to rule on Marshall’s violation before the election, but those requests have been ignored. The Ethics Commission is comprised of Jerry L. Fielding – Chair, Sylacauga; Frank C. “Butch” Ellis, Jr. – Vice Chair, Columbiana; John Plunk, Esquire, Athens; Judge Charles Price, Montgomery and Beverlye Brady, Esquire, Auburn. These individuals can hold a hearing at any time to rule on the ethics complaint filed against Marshall but have so far failed to act.